Dr. Frank’s Fetal Extractor is a precision veterinary instrument designed to deliver calves quickly and safely, with less effort. Developed by B. N. Frank, an obstetrics specialist, the fetal extractor has become the standard tool in the cow/calf industry. 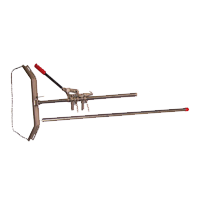 Dr. Frank’s Fetal Extractor allows cattlemen to supply uniform, consistent tension. As a result, there is no slipping or backing up. Traction on the calf and the counterthrust against the cow induce the spreading of the pelvic bones, the elevation of the abdomen, and the arching of the cow’s back. Operated with a rotating motion, Dr. Frank’s Fetal Extractor works with the natural birth process, at a speed that matches the dilation of the birth canal and the cow’s pelvic muscles as the fetus passes through them. Because of this, ‘locked hip’ deliveries are made relatively easy. For cows that cannot stand up on their own anymore, such as right after giving birth. 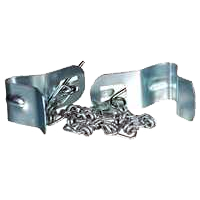 The gummed clamps are adjustable to the cow’s size. The lift is placed over the cow’s hips and tightened as necessary by cranking the handle, which secures the cow as she is lifted. This enables cow to regain the use of her legs so she can be milked or treated. 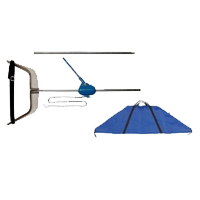 The Ratchet Style Calf Puller offers both a zig-zag pull, which helps avoid locking of calf’s shoulders in pelvic opening, and single-pull option. Extremely durable jack allows for one-person operation with a large, comfortable handle. 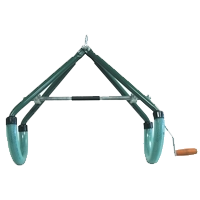 66″ pair steel rods lock into breechen for added stability during calving process. The Ratchet Style Calf Puller features smooth, clean grooves to lessen wear and operate more quietly. Easily disassembles for cleaning and storage.